For certain Tolkien collectors (and I am especially one of them), few things will enhance a book’s value more than having the author or illustrator hold the book in his hand and sign it, especially if you witness the signing and have it inscribed to you personally. In the case of professor J.R.R. Tolkien this is, as we all know, of course an impossible thing. The most desirable copies of Tolkien's books are signed or even better inscribed copies of the Hobbit and the Lord of the Rings. These are incredibly valuable because Tolkien signed so few copies and these were usually given to friends and family members. And J.R.R.Tolkien never did anything like a book signing. The result is that very few copies exist with his signature and there prices are incredibly high. The books which were in Tolkien's library are very interesting books indeed. Most of them are very interesting philological works. Most of them are very rare already and with Tolkien's signature on the fly leaf and with annotations inside they get really unique items. Another good place to find Tolkien owned and signed books is of course abebooks. There are always some up for sale. Yet most of the time the seller are antiquarians and do ask a high price for books like these. At the other hand they are always giving a good provenance letter with the book, proving this book having a real signature. Most of these books can be tracked down to one of the previously mentioned booksale. Which already is a perfect provenance, since these books were sold by renowned booksellers. Once you get to the point you start collecting Tolkien's personal books, your collection grows to another level (or so i felt about it). To me there were several reasons why i started buying these books. First of all i treasure these books, since they were part of Tolkien's personal life. They are signed, have a clear history and are full of annotations. Secondly because they are signed books by J.R.R. Tolkien, making them a good investment. Prices are getting higher every year. Thirdly, and maybe most important to me is this: Tolkien used these books and therefore had read these works. Reading these books and studying these books can give us an insight into Tolkien's background. Who knows what is inside these books that could have been of importance in the creation of Middle Earth. This is also the reason why i started assembling a list of all books which have been up for sale and can be found around the globe in numerous library's. Soon i hope to be able to finish and publish this list since it would be a great resource. Not only for collectors (to verify whether the book is on the list) but mainly for Tolkien scholars. All help to accomplish this list is more then wanted and you can there for always contact me here. Smith, Thomas. De recta et emendata linguae anglicae scriptione Dialogus. Vienna, Austria: Halle a. d. S, 1913. Original brown wrappers, exterior soiled, , rear panel separated, mostly unopened with page edges un separated and uncut. viii + 61 + (6) + 44 + xxii pp. In ballpoint pen, on front wrapper: "THOMAS SMITH / (1568) / De recta et emendata linguae / anglicause scriptione dialogus." Tolkien added his calligraphic fountain pen signature, "JRR Tolkien" below this, followed by, "from E.V. Gordon. / April / 1933" adding his three-dot symbol beneath the date. The fountain pen signature and note were written over an earlier, faded signature and note in pencil, also in Tolkien's hand: "JRR Tolkien / From EVG / 1933/." E(ric) V(alentine) Gordon was one of Tolkien's good friends. They met when Gordon was appointed as a junior lecturer to "the language side of the English Department at Leeds" (J.R.R. Tolkien - the Authorized Biography, Humphrey Carpenter, p. 104) in 1922. "This small dark Canadian (who was unrelated to George Gordon) had been a Rhodes Scholar at Oxford, and Tolkien had tutored him during 1920" (104). Tolkien and Gordon collaborated on "a new edition of the Middle English poem Sir Gawain and the Green Knight, as there was none in print that was suitable for university students. Tolkien was to be responsible for the text and glossary while Gordon would provide the greater part of the notes" (105). The translation was published by the Clarendon Press in 1925. They also collaborated on "A Glossary of Middle English," and "helped to found the Viking Club amongst undergraduates, which besides drinking, singing and reading sagas, translated nursery rhymes into Anglo-Saxon" (The Tolkien Family Album, John and Priscilla Tolkien, p. 47). Gordon passed away from an undiagnosed kidney disorder in 1938. Fox, Adam. English Poem on a Sacred Subject. London, England: Oxford University Press, 1929. First Edition. Original Wraps. Signed. A good copy in wrappers, chipped at the spine and edges, with tanning to the margins. Front and back covers separated. Signed in ink, on upper right corner of the cover, in Tolkien's hand, "JRR Tolkien." Unfortunately the signature has been somewhat compromised by a chip in the cover that has taken out the "olk" in Tolkien. Also included is a printed sheet that reads, "Sent with the Author's compliments and in / accordance with the conditions of the prize. // Magdalen College, / Dec., 1929." 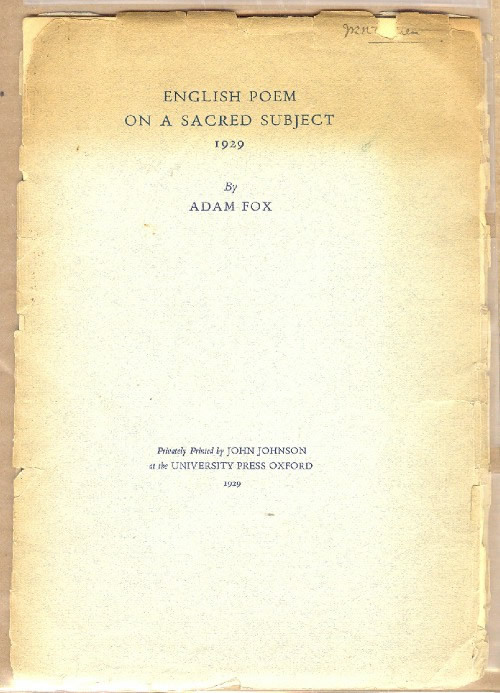 Adam Fox eventually became a member of The Inklings, and a friend of both Tolkien and C.S. Lewis. From Jack, the definitive C.S. Lewis biography by George Sayer: "Another breakfast companion was Adam Fox, the devout and gentle dean of the Divinity School, who helped Jack along the road to Christianity by his example and wise advice. Fox was also a lover of poetry, although not as an academic..." [p 190 (more information continued through p. 191)] From C.S. Lewis at the Breakfast Table, ed by Hames T Como (with an essay by Adam Fox called "At the Breakfast Table"): "Author, preacher, and poet, the Reverend Canon Fox, late of Westminster, was born in 1883 and went on to win the Sacred Poem Prize, to be a Fellow of Magdalen College, Oxford, and to be a Professor of Poetry at Oxford University... Canon Fox died in 1977." The "Sacred Poem Prize" was for the contents of this offprint. Nordal, Sigurdur. 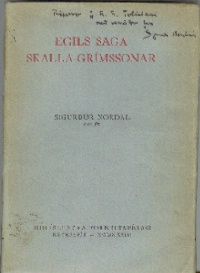 Egils Saga Skalla-Grimssonar. Reykjavik, Iceland: Hid Islenzka Fornritalfelag, 1933. Very good, in original faded blue wraps. 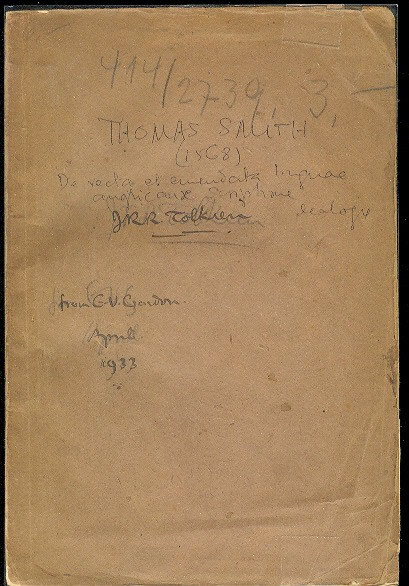 Inscribed to Tolkien by Nordal in ink, on upper front wrapper. Penciled note in the margin of page 9 by Tolkien. Also laid in are three small pages, pinned together, of inked notes regarding the text. They do not appear to be in Tolkien's hand, and perhaps were written by one of his pupils. Maps to rear. Interestingly, one of the characters in Egils Saga is named "Frodi." From Humphrey Carpenter's Authorized Biography of Tolkien, pages 64-65: "He found even more to excite his imagination when he studied his special subject. Old Norse (or Old Icelandic: the names are interchangeable)... he now made a thorough study of its literature.... and so it was he came upon the ancient storehouse of Icelandic myth and legend.... It had a profound appeal to Tolkien's imagination." Nordal clearly wanted to have his work read and commented on by one of the leading english speaking experts in the field, and sent a complimentary copy to Tolkien who kept it in his personal library. Forster, Max. Die spataltenglische Ubersetzung der Pseudo-Anselmschen. Leipzig, Germany: Mayer & Muller, First Thus. 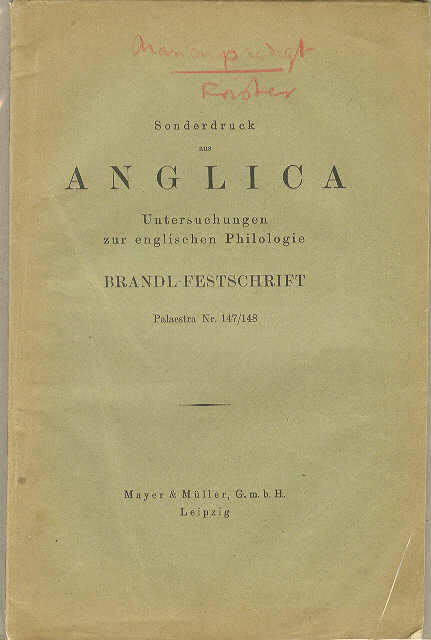 Offprint from Anglica - Untersuchungen zur englischen Philologie - Brandl-Festschrift. Original wraps slightly creased. Edges spotted, some internal spotting. Some page corners creased. Tail of spine split. Very good. Inscribed in Tolkien's handwriting on the upper cover in red pencil: "Marienpredigt. Forster." Campbell, Alistair (ed.). 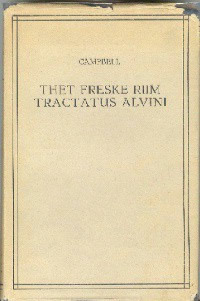 Thet Freske Riim - Tractatus Alvini. The Hague, Netherlands: Martinus Mijhoff, 1952. First Edition. Books is near fine condition in original publisher's cloth, very good dustjacket with some chipping to corners, top and bottom of spine. viii + 234 pp. Inscribed (apparently by the author, although the writing somewhat resembles Tolkien's), in ink, on front free endpaper: "J.R.R.T. with the editor's kind regards." Corrections by Tolkien in pencil on three pages. The editor, Alistair Campbell, was one of Tolkien's friends, and often visited him at his Merton Street flat in Oxford, where Tolkien spent his last years following Edith's death in 1971. Fiedler, H.G. Two Problems of the German Preterite-Present Verbs. 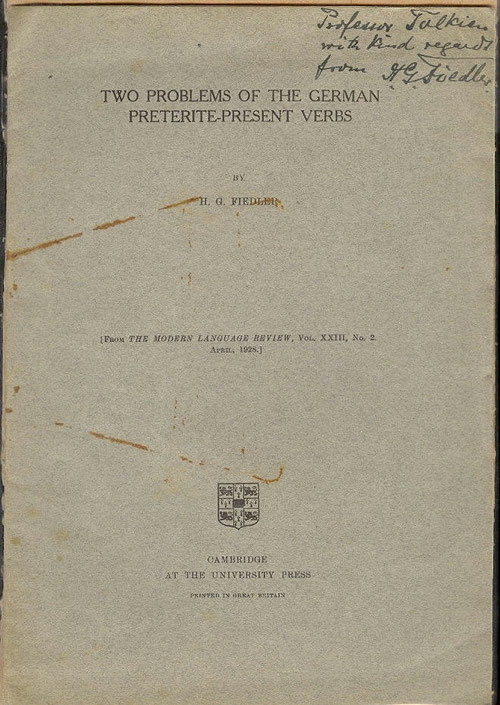 Cambridge, Great Britain: Cambridge University Press, 1928. First Thus. Good condition offprint in original wraps from The Modern Language Review, Volume XXIII, Number 2. Covers rust marked and slightly creased. Binding string snapped. Top corners of pages creased. Presentation copy from the author to J.R.R. Tolkien. Inscribed by the author, "Professor Tolkien with kind regards from H.G. Fiedler." There is also one minor correction to the text, probably by Fiedler. Tolkien, J. R. R. Middle English Losenger: Sketch of an etymological and semantic Enquiry. Paris, France: Societe D'edition Les Belles Lettres, 1953. First Thus. 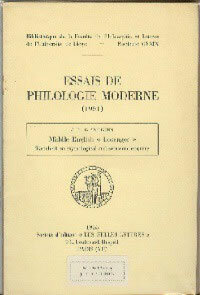 Reprinted from Essais de Philologie Moderne, 1951. Like new, in original wraps, bearing a "From the Library of J.R.R. Tolkien" sticker on the bottom center of the cover. Tolkien did not place these stickers on his personal books himself. At the time of his death, a large portion of his personal library was sold off, and a local entrepreneur bought a large quantity of the books and put these stickers on many of the unsigned volumes in order to preserve their provenance before selling them off. Whenever you feel to add something or want to write a review, please send it to me!